You’ve walked for days and you have finally reached the promised land: Santiago de Compostela! You are sitting at the Praza do Obradoiro, your aching feet finally getting a rest, staring in awe at the mighty Cathedral and you are wondering.. where to next? If you have booked your trip with CaminoWays.com, your last walking day should be one of the shortest. This should leave you enough time to make the 12pm Pilgrim Mass taking place daily at Santiago Cathedral. If you are arriving on a Friday, you can try to go to the evening mass (7.30pm) instead, where you will be able to see the giant thurible (Botafumeiro) in motion. 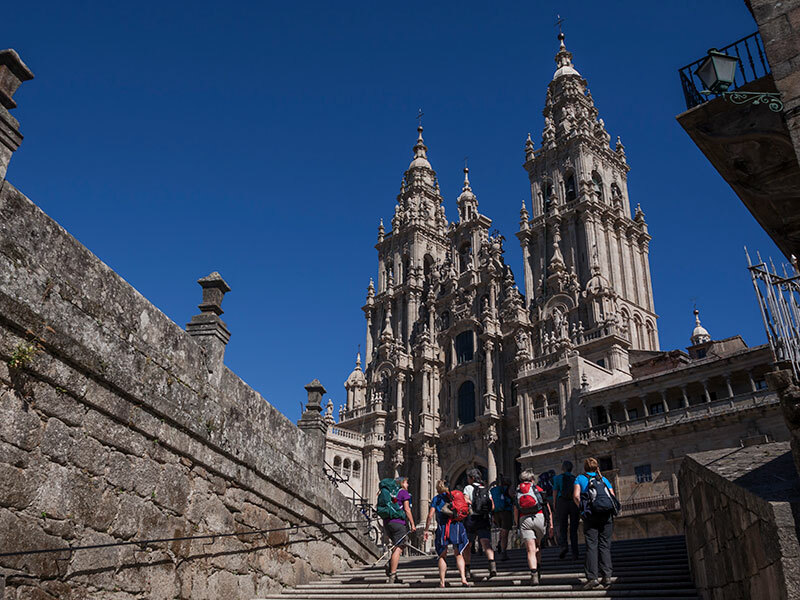 If you have walked at least the last 100kms into Santiago or cycled the last 200kms, and stamped your pilgrim passport along the way, you should request your Compostela certificate from the Pilgrims Office (please note there are queues during busy periods but they open from 8am until 9pm from May until October). The Compostela is a certificate in Latin stating that you have completed the Camino for religious reasons, however there are other pilgrim certificates available such as the Certificate of Distance and the Certificate of Welcome. 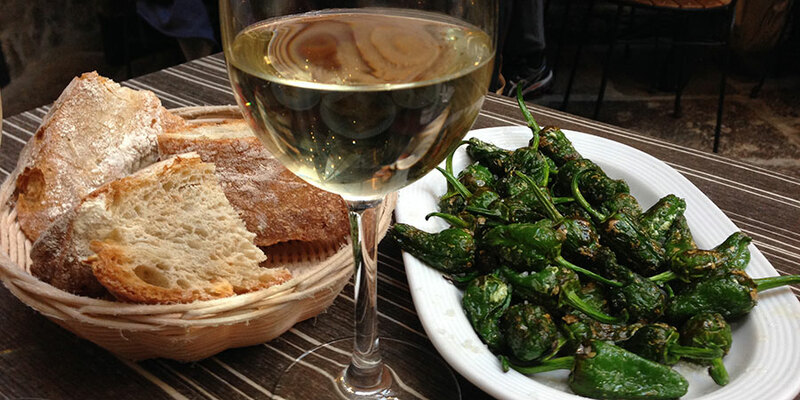 With your Compostela in hand, it is time for a well deserved bite! Bars and restaurants are plentiful in Santiago’s Old Town (and also in the New Town if you are venturing further afield). 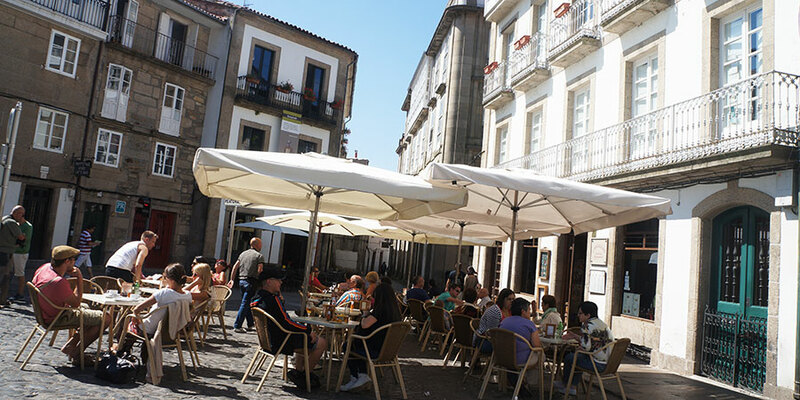 Head to Rua da Raiña, Rua do Franco or the terraces around Mazarelos and the Abastos market to sample Galicia’s famous gastronomy. Seafood is king but you will also have plenty of other delicious options. 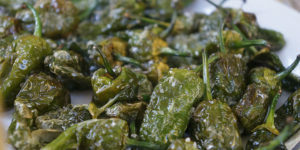 Some dishes will vary depending on the season but menus will generally feature the all-time classics such as tortilla, empanada (savoury pastries) and caldo (Galician stew); as well as a selection of fish and meat. You’ve done quite a fair bit of walking you might say however, the Alameda is definitely worth that little extra effort. 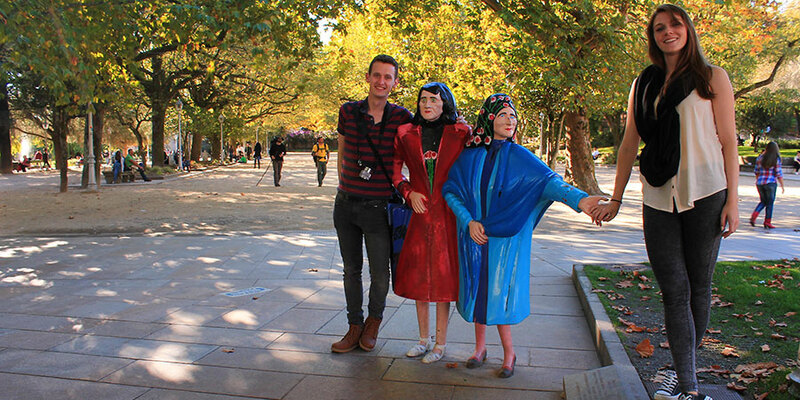 Go for a stroll in Santiago’s best loved park and ‘carballeira’ (oak grove). 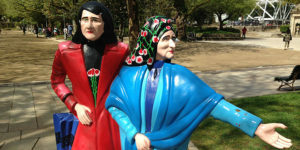 You can get great views of the cathedral and you should get the ‘de rigueur’ picture with the parks’ iconic statues: colourful As Marias and sitting by pensive Valle Inclan. After a bit of a rest and a freshen up, it’s time to hit the cobbled streets of the Old Town again to sample a few famous pinchos. While it is still a bit early for dinner time (most restaurants serve dinner from 8 or 9pm), if you go for a drink, most bars and restaurants will serve it with a complimentary nibble at this time of the day. This is no ordinary peanuts and olives affair but a fully fledged cooked little pincho, served for free with each drink. Some establishments specialise in specific pinchos, for instance La Tita in Rua Nova, serving one of the country’s most famous tortilla. From pinchos, if you still have space for more food, you can move directly on to dinner and order a few ‘raciones’ (portions) for a casual and relaxed dining experience or try some of the up and coming new restaurants in Santiago experimenting with Galician classics and giving them their personal, modern twist. After a bit of food, you can go for a nightcap at Modus Vivendi, the oldest pub in town; or any of the other atmospheric bars scattered around the nooks and crannies of the Old Town. Places like Tarasca are also good for a bit of a boogie. After a good night sleep and a leisurely breakfast we recommend you make the most of your last morning in Santiago taking the Cathedral rooftop tour, which gives visitors a fantastic new perspective, as well as covering the history not of just the cathedral but also the city in general. Depending on the time available you could also take one of the brilliant and informative guided tours of the Old Town run by Santiago Turismo. Highly recommended to understand the history of this wonderful city. And no visit to Santiago is complete without a wander in the Abastos food market, always buzzing with locals and visitors getting their groceries. Treat yourself to a mug of chocolate con churros in one of the cafes around the market and grab a few souvenirs (edible or not!) to take home. It is also a great place to enjoy a last bite before you catch your flight home! Of course, if you have more than 24 hours, there are many more fantastic things to do in Santiago: visit the University, plenty of museums such as Pilgrimage Museum, the Galician Museum of Modern Art or the Museum of the Galician People; as well as great parks and evening entertainment.